Students get a “kick” out of the ESSN Soccer Carnival! Q: Why is a World Cup soccer stadium the coolest place to be? Students from across 7 schools travelled to Cannington Community ESC to compete in our annual ESSN Soccer Carnival on Tuesday 23rd October. Mother Nature turned it on with a warm and sunny day; perfect conditions to enjoy some friendly competition and tolerate the terrible soccer jokes inflicted on us between each game. 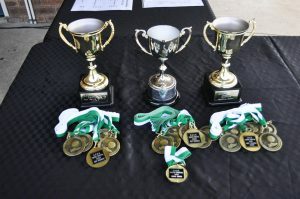 Every effort was made to create an inclusive competition because, at soccer carnivals, we don’t “Messi” around. For example, the soccer matches used modified game rules and fields to support the participation of all students in the soccer matches. 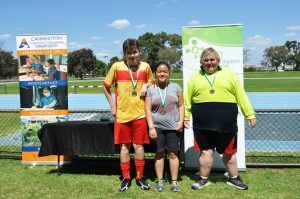 We also invited WADSA (Western Australian Disability Sports Association), who set up a range of fun and accessible sports activities, and coaches from Football West, who were there to train students in soccer skills. A special thanks also goes to the volunteer students from Lynwood High School Soccer Academy who supported students and staff throughout the day. Community News paid us a visit to get the “scoop” and a photograph for our local newspaper (so keep an eye out!). Well, someone must have brought some string because the scores were tied in the Grand Final (John Tonkin College ESC vs CCESC). It came down to a “play on” which resulted in John Tonkin kicking the winning goal, securing them the big trophy for Division 1 (Score 1-0). Well done to the Cannington players who put in a huge effort. Don’t worry – we’ll get the trophy back next year! The Division 2 trophy was taken out by Atwell College thanks to a few talented goal-scorers who knew how to bend it like Beckham. Thank you to our representatives from the Special Olympics who awarded students with their medals and schools with their trophies! All in all, the day was a roaring success due to the energy of our students, enthusiasm of our staff, and impeccable organisation. Thank you to all the participating ESSN schools for making the soccer carnival such an enjoyable event for everyone involved.